Researchers at the Los Alamos National Laboratory are modeling huge ocean eddies to track their ability to move particles – including carbon dioxide – into the deep. This work will help prioritize a global response to climate change. 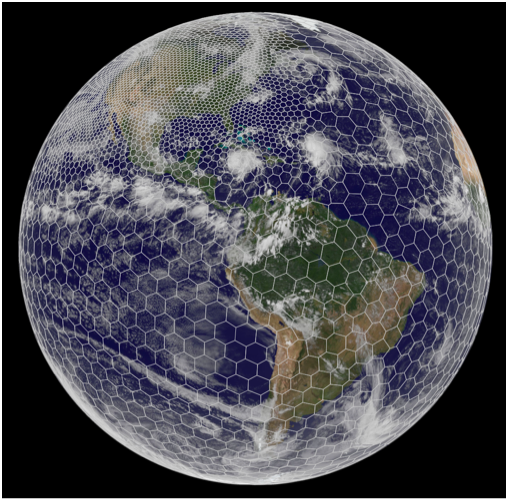 Spherical Centroidal Voronoi Tessellations used to segment the earth's surface into discrete sections for easier mathematical analysis. Courtesy MPAS. To better understand how carbon dioxide (CO2) moves around the globe, scientists need to know what happens as the ocean circulates. 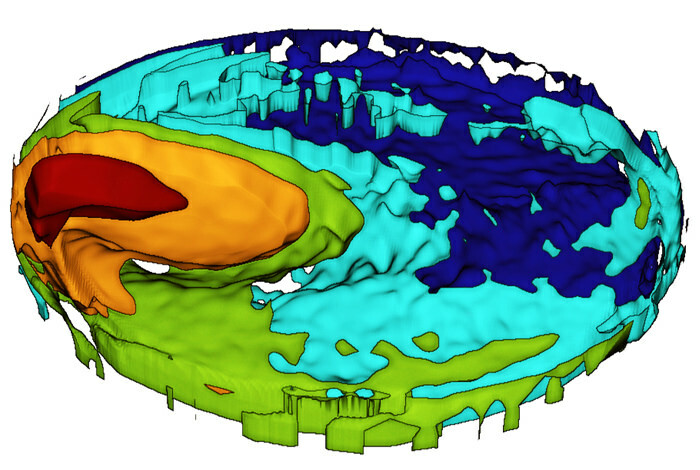 Los Alamos National Laboratory (LANL) computer models clarify the complex ocean mixing process occurring in mesoscale eddies across the open ocean, and what they show will help prioritize responses to climate change. Mesoscale eddies, considered the 'weather' of the ocean, circulate across hundreds of miles and over several weeks' time. These eddies move heat, carbon, and other biogeochemical tracers from the ocean surface into the deep ocean, helping regulate the global climate and distribution of natural marine resources. To model these huge swirls, researchers at LANL turned on the LIGHT – the Lagrangian In-situ, Global, High-performance particle Tracking model. Because of its tight integration with today's supercomputers, this model is a first-of-its-kind tool. 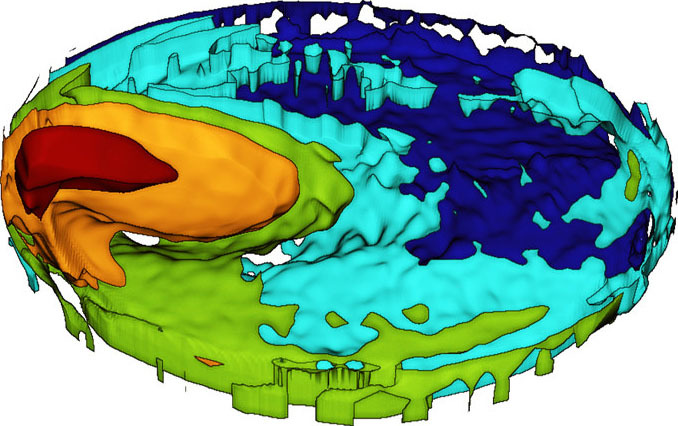 The model revealed the role mesoscale eddies play in capturing carbon. “This happens very slowly, but over the next 1,000 years, much of the fossil fuel carbon emissions will end up in the deep ocean; ocean eddies make that happen,” says Todd Ringler, who leads the Accelerated Climate Model for Energy (ACME) ocean science team at Los Alamos. Ringler's team conducted ocean simulations with a massive number of particles spread evenly throughout the ocean; each particle is carried along with the ocean currents. “Each particle tells us about the ocean currents, and groups of particles tell us how turbulence in the ocean mixes temperature and carbon dioxide throughout the ocean,” says Phillip Wolfram, a postdoctoral researcher at LANL and a member of the ACME science team. A three-dimensional spatial structure of mixing in an idealized ocean simulation, computed using Lagrangian particle statistics. Courtesy LANL. Click for larger image. Despite the ocean's role in CO2 sequestration, more emissions are entering the atmosphere than can be held under the sea. Moreover, “this oceanic CO2 doesn't simply disappear — it eventually comes back to the surface on time scales of 100s to 1000s of years,” says Wolfram. The simulations will be released as part of the Model for Prediction Across Scales Ocean (MPAS-O), a core component of ACME. The MPAS-O is a global, multi-scale ocean code that simulates spatial and temporal scales ranging from coastal dynamics to basin-wide circulations. The global ocean and its role in the evolution of global climate change is the primary application for MPAS-O. The team recently published their research in the Journal of Physical Oceanography. The results highlight the capability of LIGHT to compute the horizontal and vertical structure of diffusivity within the high-performance computing of MPAS-O. “This project quantifies the key fundamental processes of the ocean and points the way to improved techniques to better simulate climate change over a range of spatial and temporal scales,” Wolfram says.